I hinted at this earlier this week, but today I'd like to talk to you about my new Patreon page! We want to help every creator in the world achieve sustainable income. I love that idea. And I do believe that all creators out there should have a sustainable income. The world is a better place with things like art and yarn and knitting patterns in it! I greatly appreciate every single person who has bought a pattern, read a blog post or bought one of my knitting books. If you like those things and are curious about the behind-the-scenes process, please consider becoming a patron. As a patron, you’ll get exclusive content not being shared anywhere else. Depending on your pledge level, you’ll get access to sneak peeks of my upcoming designs, exclusive Ravelry coupon codes and even free patterns! 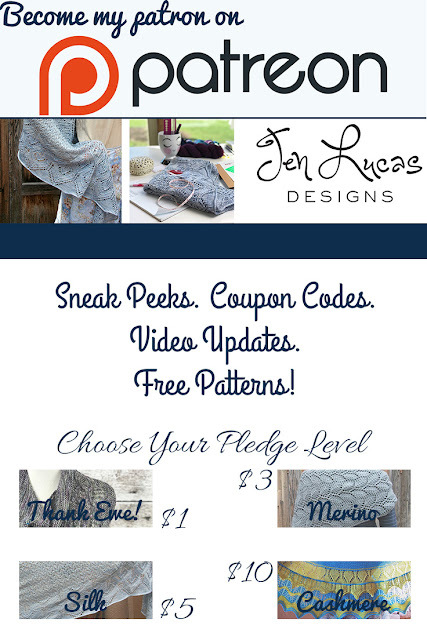 In addition to getting your hands on fun rewards, you’ll also be helping me cover the expenses involved in running Jen Lucas Designs. 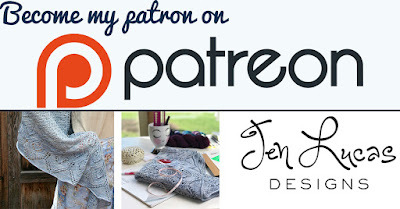 Some of these expenses include Ravelry, Paypal and Adobe fees, tech editing and photography – all things that are needed to bring you great accessories patterns! My patrons are already taking advantage of sneak peaks and coupon codes. All my $5+ patrons receive my new Demantur shawl for free. And, don't worry, I'll still be sharing fun stuff on all my various social medias and blog (of course). This is just something fun for those people that want even more behind-the-scenes content and want to help in offsetting some of the costs associated with running my business. You can join my Patreon for $1 to $10 a month. You can read all about the rewards you get at each level here.